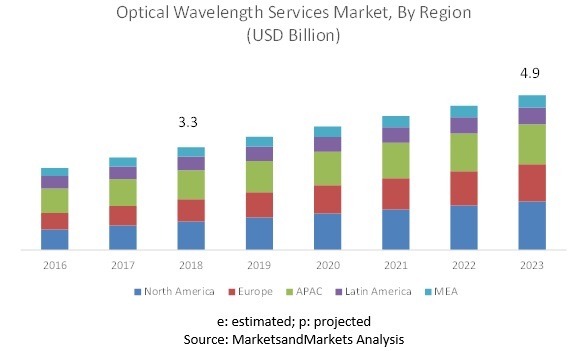 [109 Pages Report] MarketsandMarkets forecasts the global Optical Wavelength Services (OWS) market size to grow from USD 3.3 billion in 2018 to USD 4.9 billion by 2023, at a Compound Annual Growth Rate (CAGR) of 8.5% during the forecast period. The advent of Internet of Things (IoT) and growing automation trends have exponentially increased data traffic thereby creating heavily-increased bandwidth requirements for large enterprises and Small and Medium-sized Enterprises (SMEs). Further increasing demand for high-speed internet and fiber optics communication has become the backbone thereby increasing the demand for OWS. Advancements in technology with regards to communication standards are expected to create opportunities for OWS vendors. OTN offers various advantages over traditional WDM transponder-based network, including increased efficiency, reliability, and secure wavelength-based private services. Furthermore, OTN switches at fiber junctions enable the optimal use of the optical spectrum. The increasing bandwidth demand and connectivity between Data Centers (DCs), along with the adoption of consumer 4K and higher video content and services on a number of devices is a major driver for the adoption of metro applications. Networking infrastructure in APAC has increased significantly over the past few years. The APAC market is estimated to hold the highest market share in 2018. The developing countries in APAC are still upgrading their communication infrastructure as a part of the digital transformation process. With a large number of IT sector businesses located in the region, the demand for end-to-end wavelength services is high in the region. Governments of various developing countries are also taking initiatives to encourage or to speed up the development of communication infrastructure in these countries. China, Japan, and India are some of the prominent countries with strong fiber optic infrastructures in APAC. In the OWS market, key and emerging market players include Zayo Group (US), Nokia (Finland), Verizon (US), GTT (US), CenturyLink (Louisiana), AT&T (US), Sprint (US), Comcast (US), Colt Technology Solution (UK), Crown Castle (US), Windstream Enterprises (US), Charter Communications (US), Cox Communications (US), and Jaguar Network (France). These players have adopted various strategies to grow in the global OWS market. They have adopted organic and inorganic strategies, such as new product launches, acquisitions, business expansions, and partnerships, to expand their business reach and drive their business revenue growth. Moreover, various OWS providers are adopting various strategies, including venture capital funding, funding through Initial Coin Offering (ICO), new product launches, acquisitions, and partnerships and collaborations, to expand their presence in the global Optical Wavelength Services market. In January 2019, Zayo announced its collaboration with Oracle to provide enhanced cloud connectivity services. Zayo’s CloudLink technology will be used to provide a secure and direct connection to Oracle’s cloud infrastructure. In February 2019, Nokia partnered with the Germany-based carrier service provider M-net for the field trial of probabilistically shaped wavelengths using Nokia’s PSE-3. In May 2018, Chorus, a telecommunication infrastructure provider, collaborated with Nokia to implement the vision of One Open Access Network Infrastructure. It launched wavelength services using Nokia’s services assurance. In January 2018, Verizon conducted the field trial of 400Gbps traffic on a single wavelength. The company used its packet-optical network to conduct the trial. In December 2018, GTT acquired Transbeam, a provider of managed data and voice services. The acquisition added to GTT’s client base in the US especially in hospitality, entertainment, and retail sectors. What are the upcoming trends in the Optical Wavelength Services market? What are the key roles of major players in the OWS market? The study involved 4 major activities to estimate the current market size of the Optical Wavelength Services (OWS) market. Exhaustive secondary research was done to collect information on the market, peer market, and parent market. The next step was to validate these findings, assumptions, and sizing with the industry experts across value chains through primary research. Both top-down and bottom-up approaches were employed to estimate the complete market size. Thereafter, the market breakup and data triangulation procedures were used to estimate the market size of the segments of the Optical Wavelength Services market. In the secondary research process, various secondary sources such as D&B Hoovers, Bloomberg BusinessWeek, and Factiva have been referred to, for identifying and collecting information for this study. These secondary sources included annual reports; press releases and investor presentations of companies; whitepapers, certified publications, and articles by recognized authors; gold standard and silver standard websites; regulatory bodies; and databases.